I no there is no try, only do. But you have to try and do to get better. I have ventured a couple toes back into the water of being a competent cook. DH and I have officially been indoctrinated into the world of America’s Test Kitchen. The recipes are tested – which speaks to my science-y schooling and upbringing. The best recipes give me a chance to be good. I still fumble and stumble in the kitchen. But I am trying. And inch by inch I get better. Last night I made this taco salad – not much “cooking” other than making my own taco seasoning and lime vinaigrette. Yummy, taco-y baby steps. I have actually gotten better at cooking over the last 3 months. Truly. Focusing has helped me a lot. I cook almost solely from the Bonne Femme cookbook by Winnie Moranville. I read some great reviews about this book – and the reviews ended up being absolutely right. My favorite section (like many of the reviewers) is saute-deglaze-serve. It is a pattern for making different meats with yummy sauces. I have been doing mostly chicken, since these are “weeknight” cooking it seems that a “healthier” cut of meat is called for. Here is my vision. I come home from a hard day at work, open a bottle of wine, and DH and I chat while I pull together a deliciously simple meal – without looking at a cookbook once. 1. The ingredients I need usually are in stock in the house. 2. I am better at timing. 4. I am excited, not overwhelmed, at the thought of putting together a meal. Now I want to become flawless and memorized – that cooking becomes second nature while I unwind for the day. In that spirit, I am going to focus on cooking seven different meals over and over and over again until they are pretty darn perfect. I am calling this The Seven Chickens Project. I have found seven chicken recipes from Bonne Femme that I know I like. Those recipes are Pear Vodka Chicken, Fritalian Chicken, Devil Chicken, Swiss Chard Chicken Salad, Apple Brandy Chicken, Grape Chicken, and Cassolette Chicken. Those aren’t the names in the cookbook, but that is how I remember them. On the weekends I will do more “special” cooking – things that take a bit more time – more on those later. I’ll keep you posted – good or bad! OK YUM! DH and I made Chicken Francese – chicken that the Italians make that they credit to the French, basically, I think. This was so yummy. The sauce is pretty simple – lemon, white wine, garlic. It had such an impact though – absolutely wonderful tasting. I cheated by using chicken thighs instead of chicken breast, so that amped up the flavor a bit too. I will be doing this one again and again and again. Paired with a salad and heat-and-eat dinner rolls, so easy and so yummy for a weeknight. Recipe is Bonne Femme, of course. 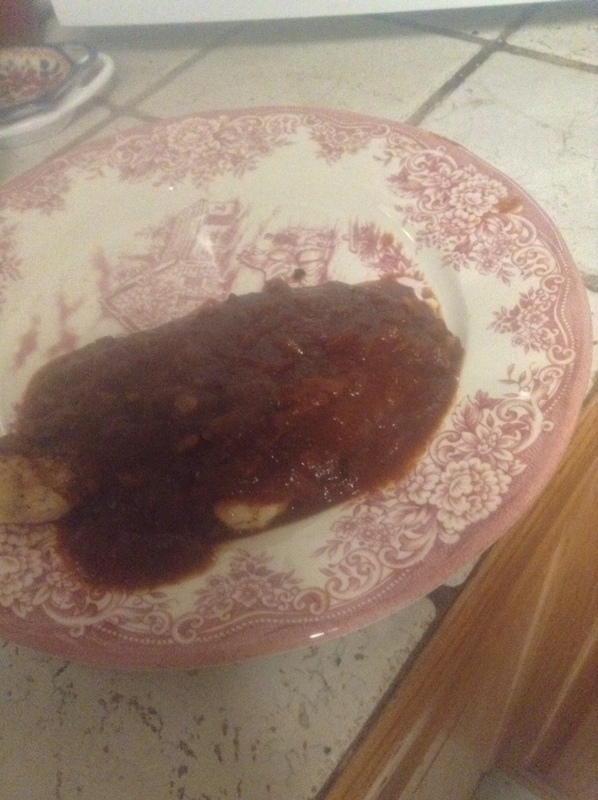 My sauce came out darker than it should have because I let some stuff burn at the bottom, but didn’t seem to stop the sauce from being delicious. And YUM! And I promise that is the last time I will say yum in this post. It is December. It is cold. It is Monday. This is dinner. I am trying to make cooking interesting, tasty, simple, easy meals a normal occurrence around here. I am challenging myself to cook on Monday nights. Most Monday nights I would like to crawl under a blanket and eat a cheeseburger. But I have been finding that once I start to cook, it isn’t that bad. DH and I deconstruct our day and our world while preparing the meal. It helps to have an open bottle of wine. It helps to have been together enough to have everything defrosted and purchased. (I am pretty sure driving to the store before would make me loose all my steam.) It helps to be cooking something that you know will be yummy. 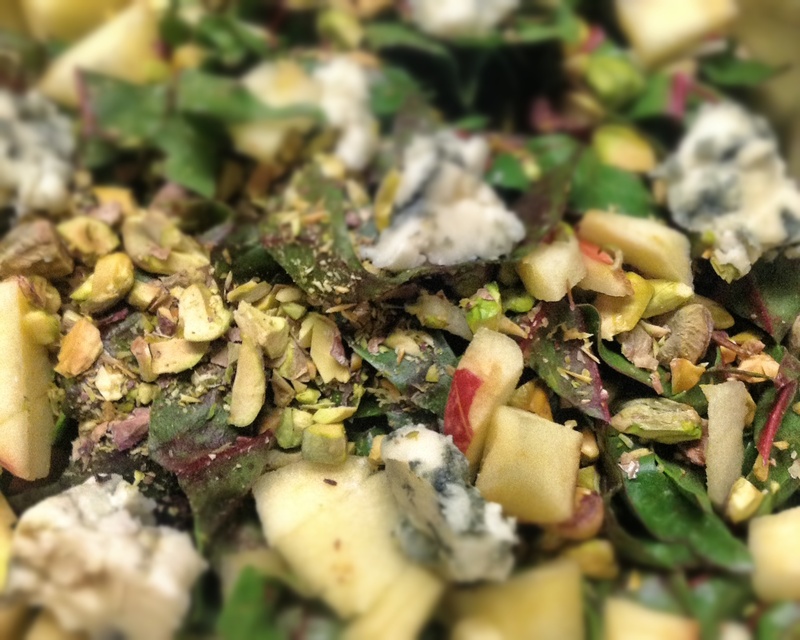 Last night we made a delicious salad with chard, chicken, pistachios, Roquefort, apples, and balsamic vinegar from the Bonne Femme cookbook. And it checks all the boxes – interesting, tasty, simple, easy. And this one has the bonus checkbox of maybe being sort of healthy also. I ate a lot more chard than I would otherwise, for sure. 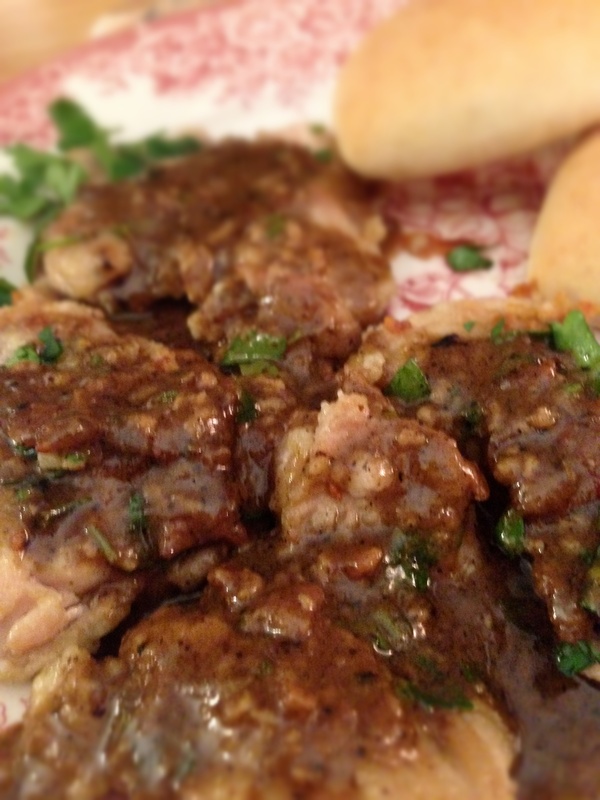 Another successful recipe from Bonne Femme – Chicken a la Diable. DH would have liked it a bit more spicy – I think the devil in the diable was overpromised by me. When I poured in the wine for this recipe, it set off the smoke alarm – so there was some devil there. This called for a tablespoon of tomato paste, but at DH’s encouragement I used a lot more, so we got a lot more sauce. Sometimes cooked tomato sauces don’t taste very good to me, but this one was excellent, of course. I am getting good at this saute and deglaze thing. Having a good sized pan helps, definitely. And this weekend, I can’t wait to cook stuff with my brand new shiny stove. Up next is braised beef and normandy pork chops. Woot. I know this food blogging is horrible – not sure where I am going with it. I have been such a wretched cook in the past that I am so proud of myself – but still there isn’t any point. I am going to think about it. Maybe better pictures, sharing my meal plans, favorite ingredients? I don’t know… I’ll think about it. In the meantime, here is another horrible picture of some good food I cooked. Maybe that is my hook? 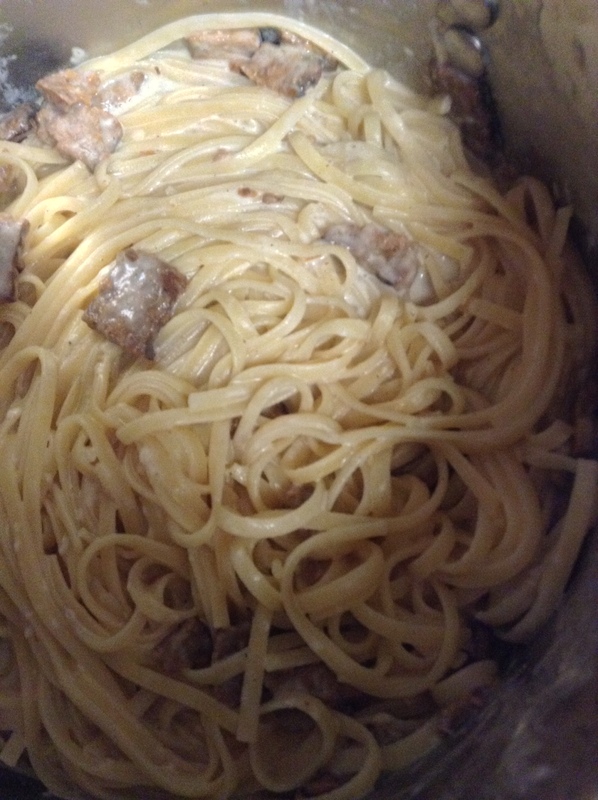 Bad pictures of good food I cooked. Without further comment. Gosh, I’m pretty sure you would miss this scintillating commentary though? When we have the kids for the weekend, I have to abandon my meat-based cooking because my SD is a vegetarian. Which is good for me and good for us. Last weekend I made a bacon and gruyere pasta from the Bonne Femme cookbook. This weekend I made the same pasta, but had to replace the bacon with fakin’ bacon. And add some olive oil because there is a bit more than a small difference between the amount of fat in thick-cut bacon and tempeh with smoke flavoring. But yum – I really do love the taste of fakin’ bacon – and should use it as a substitute more often, even when the kids are with us. And here is a really horrible picture of the pasta with the fakin’ bacon. So sorry. I have had a really great 24 hours. Last night DH and I made Coq Au Vin. Seriously. LIke for real. And it was wonderful… truly wonderful. Not perfect, the amount of sauce we ended up with wasn’t quite right. But the chicken tasted like the chicken you would get at a good french restaurant. Just so yummy. I do not have photographic evidence of said Coq Au Vin… you will just have to believe me. 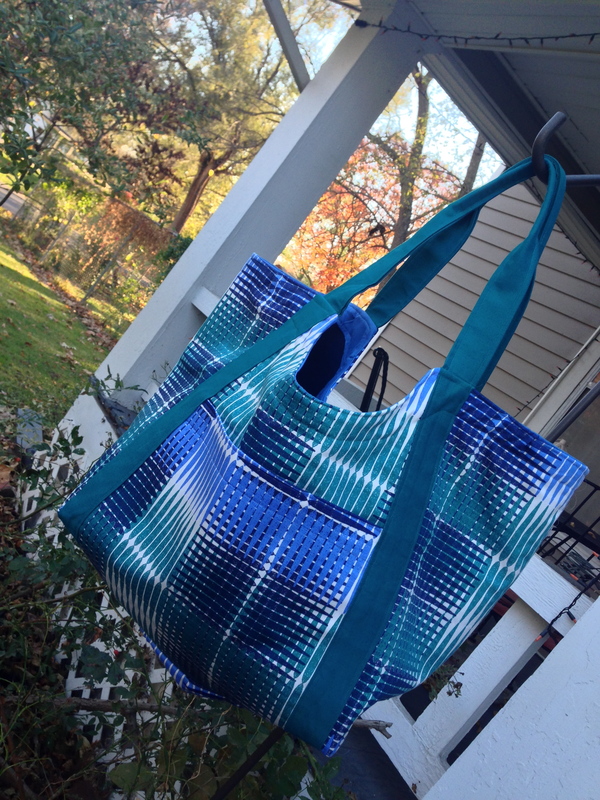 What I do have photographic evidence of is this poolside tote that I made! I am really proud of this one. As I have said a bazillion times on this blog, I could not have done this a year ago. Sewing, sewing, sewing and I am getting better. Obvious that would happen, but still cool. Now this bag is far from perfect. My topstitching still has a looooooong way to go. But it is perfectly serviceable, and I got a “that looks so cool!! !” from my stepdaughter for whom it was made (she needed a big bag for all her books and stuff). I sound very smug, I know. But I am just a technician getting better at the things I do – the pattern was by Anna Graham, the recipe by Winnie Moranville. The time and the dedication to become an expert at some things (very slowly) is mine. I am VERY LUCKY to have the time and resources to do these things. Very lucky. I am grateful – very grateful. And a wee bit proud of myself. I am about to shower after a hike through the woods and then off to cook some steak with wine and cherries. The next 24 hours are looking pretty good, too.